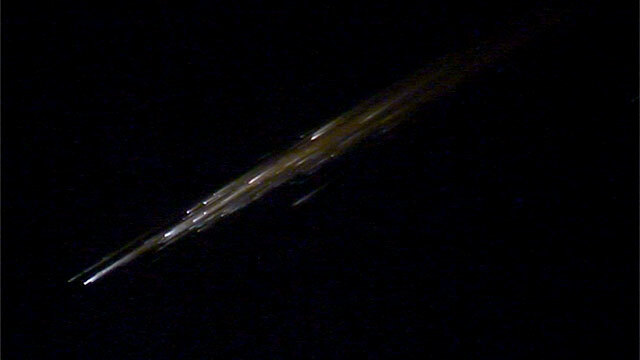 HomeSci/EnvironmentWas The Huge ‘Meteor’ Seen Flying Over Vegas Russian Rocket Debris? People from Las Vegas to Ventura witnessed a large glowing meteor like object flying across the sky on Tuesday night. Video’s posted across social media appear to show multiple parts of the object falling apart. Not everyone was convinced that the flying object was a meteor, however. Some twitter users were speculating that it could have been a secret alien visit or military weaponry….or maybe even Santa on a test run! A mysterious bright light seen by witnesses from Las Vegas to Ventura Tuesday evening was a Russian rocket body re-entering the atmosphere, not a meteor as previously thought, according to the U.S. Strategic Command. The light was first reported by dozens of witnesses shortly after 6 p.m. Hours later, around 9:30 p.m., officials said it was a Russian rocket body. “U.S. Strategic Command’s Joint Functional Component Command for Space (JFCC Space), through the Joint Space Operations Center (JSpOC), removed a Russian SL-4 rocket body from the U.S. satellite catalog as a decayed object after it re-entered the atmosphere today over North America (vicinity Arizona),” around 6:08 p.m. PST, said Deputy Public Affairs Officer Julie Ziegenhorn. Officials could not accurately track the object after its initial contact with the atmosphere because of the damaging effects, Ziegenhorn added. Additional details were not available. Earlier in the evening, Griffith Observatory Director Ed Krupp said the object was a bright meteor. “The most likely thing people saw was the super heated column of air produced by a very small piece of interplanetary debris, something the size of a small pebble,” he said. Typically falling debris is natural and from our solar system, but it can also be “Earth stuff,” or debris that was in orbit that came down, Krupp said.